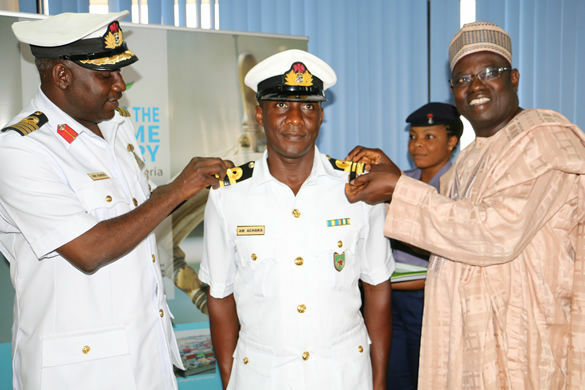 The Acting Director-General of the Nigerian Maritime Administration and Safety Agency, (NIMASA) Mr Haruna Baba Jauro, has described the partnership between the Agency and the Nigerian Navy as beneficial to the growth and development of the maritime sector and the nation at large. The director general stated this during the promotion and shipping of stripes of Surgeon Lieutenant Commander Ahmed Achaka, an officer of the Nigerian Navy posted to the Maritime Guard Command (MGC), at the headquarters of the Agency. He noted that the Memorandum of Understanding (MoU) with the Nigerian Navy, which midwifed the MGC has helped to boost security and surveillance activities on the nation’s territorial waterways. A statement by the Deputy Director, Public Relations, Hajia Lami Tumaka, said Jauro pledged the Agency’s commitment to ensuring that Nigeria becomes a safe place for business activities to thrive, thereby achieving the status of being the maritime hub in Africa. While describing the newly-promoted officer as a disciplined, modest and hardworking officer, Jauro advised him not to relent in his commitment to his duties and service to the country. Lt. Cdr. Ahmed Achaka was commissioned in 2007 as a member of Direct Short Service Commission (DSSC) Course 17 as a Sub-Lieutenant and has attended several military training in and outside the country. He is a medical doctor by profession and has a Master’s Degree in Orthopedic surgery from the Second Military Medical University in Shanghai China. He is currently serving as the Medical Officer, Search and Rescue Clinic of the Agency in Kirikiri.